The ADJ Inno Color Beam Z19 is a professional LED Moving Head fixture features motorized zoom allowing users to change the beam angle from10 to 60 degrees via DMX controls. Add the extremely versatile Inno Color Beam Z19 to your lighting set up no matter what your next show is – perfect for clubs, theaters, churches, concert productions and lighting professionals! This fixture offers 19x 10W RGBW Quad Color Osram LEDs that will keep the party going for 50,000 hours. With its quick speed and built-in light shows, the Inno Color Beam Z19 brings pure lighting excitement to any venue. 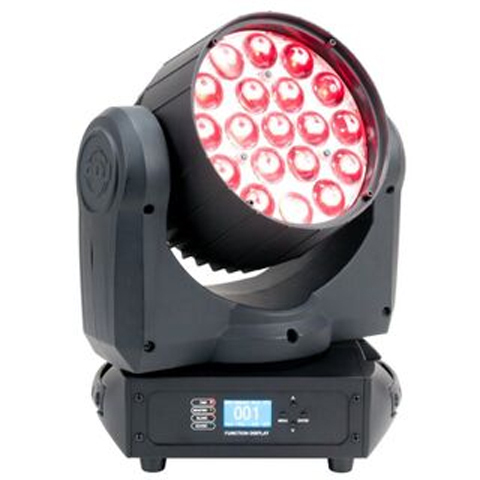 This fixture offers a wide range of professional features that let you customize your light show for the venue, music, and mood; Including electronic dimming, 64 built-in color macros, and pan/tilt reverse mode for contrasting movement when units are linked together. The ADJ Inno Color Beam Z19 fixture allows up to 5 fixtures (120V) or 11 fixtures (230V) to be power daisy-chained using IEC connector cables. The variable degree beam angle allows for increased creativity and versatility. Made from the highest quality components, this product will be the perfect addition to lighting production application.